The five CNRP representatives on the permanent committee said they would end their boycott ahead of the session. Political observers in Cambodia have issued a note of caution following suggestions that negotiations between the ruling Cambodian People’s Party and opposition Cambodia National Rescue Party could lead it to end a months-long parliamentary boycott. The CNRP returned to the National Assembly on Wednesday for a meeting on draft laws and policies ahead of a plenary session planned for later this month. Yem Ponhearith, a CNRP lawmaker, said after Wednesday’s meeting that they had attended because the party had put forward some of the proposals under discussion. “We are the ones who proposed [the draft laws], so we must come to defend our proposal,” he said. Just one week earlier Prime Minister Hun Sen had said that there would be no negotiations that could pave the way for the opposition to retake their seats. Analysts said that if the CNRP did rejoin parliament it could lead to an easing of political tensions, however, they cautioned that the situation remained volatile. Meas Ny, a social researcher, said the move was a “positive gesture” and an “acid test” for the period leading up to elections next year and in 2018. “However, we have yet to find out how the political tensions will be relieved. We have already seen how a ‘culture of dialogue’ can fade away not so long after it’s born,” he added. Officials from the ruling party and military have suggested that the armed forces could be deployed to arrest the CNRP’s deputy leader, Kem Sokha, who has not left the party headquarters for more than four months. Last month, helicopters and military police swarmed around the building in an apparent act of intimidation, which the ruling party claimed was a pre-planned military exercise. Also last month, Sokha was sentenced to serve five months in prison for failing to appear in court for questioning in another case, in which he is alleged to have had an extra-marital affair. Both Hun Sen and Sokha have recently made overtures to their respective supporters in an attempt to ease the tensions. Sam Kuntheamy, executive director of election watchdog NICFEC, said he remained concerned that if any incidents occurred in the coming days it could mean the opposition would not rejoin the political process. “Not only civil society groups, but also the international community and the voters want to see a good political atmosphere, without fear and intimidation. It will restore confidence for the voters when the two parties reconcile,” he said. 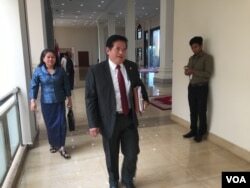 Leng Peng Long, spokesman for the National Assembly, told reporters after Wednesday’s meeting that outstanding legal cases against members of the opposition would not be affected by the opposition retaking their seats. However, following Wednesday’s meeting to CNRP lawmakers who were accused of involvement in the Sokha case and threatened with havingg their parliamentary immunity revoked – To Vanchan and Pin Ratana – were promised that no such move would take place.